Such are the obstacles and hazards besetting the new road of diplomacy between the US and Iran. This route opened up unexpectedly between Washington and Tehran, offering a way forward to resolve the protracted standoff over Iran’s nuclear program. The initial flurry of optimism last weekend has since given way to a more subdued Iranian outlook in what is perhaps the first sign of frustration on an arduous journey. This shift to a lower gear comes only days after the diplomatic high of President Hassan Rouhani’s visit to the 68th United Nations General Assembly and what seemed to be an imminent outbreak of peace. Rouhani enthralled delegates in New York and international news media with an erudite address that emphasized conciliatory global relations. The smiling, genial Rouhani wowed the American media in particular, which largely gave him a fair hearing, without mischievous bias. His “charm offensive” contrasted sharply with the combative style of his predecessor, Mahmoud Ahmadinejad, who relished taunting American and Israeli audiences by lampooning “Western imperialism” and questioning official narratives on the 9/11 terror attacks and the Nazi Holocaust. Rouhani’s more decorous diplomatic thrust and one-to-one greetings of other world leaders paved the way for a breakthrough meeting during that same week in New York between Iranian Foreign Minister Mohamad Javad Zarif and US Secretary of State John Kerry. There was a palpable sense that history was in the making as Zarif and Kerry sat side-by-side around the negotiating table. Cameras flashed to capture the cordial scene, which also included the European Union’s foreign policy chief Catherine Ashton and other members of the UN Security Council. The Iranian delegation let it be known that its top priority in coming to New York was to “jumpstart” stalled negotiations over its nuclear program in order to alleviate Western economic sanctions. The Americans seemed willing to do business, with John Kerry telling his Iranian counterpart that the sanctions could be lifted “within three to six months”. Earlier, US President Barack Obama had also set the diplomatic wheels in motion when he told the UN General Assembly that the US would respect Iran’s right to acquire peaceful nuclear technology. He said: “We are not seeking regime change and we respect the right of the Iranian people to access peaceful nuclear energy”. Obama acknowledged that this overture was premised on a new departure by the Iranian leadership, including recent statements made by the nation’s Supreme Leader Ayatollah Sayyed Ali Khamenei and the newly elected “moderate” President Rouhani. Both had stated that Iranian development of nuclear weapons was explicitly forbidden. Obama said Iran’s assurances had created “a basis for meaningful agreement”. “The roadblocks may prove to be too great, but I firmly believe the diplomatic path must be tested,” the US president told the UN assembly. Notably absent from Obama’s address was any mention of the use of military force towards Iran. Then perhaps the highlight of that week was the brief phone call between Obama and Rouhani as the latter made his way to John F Kennedy airport for his return flight to Iran. It was the first time in 34 years that political leaders of those two countries had spoken to one another. Obama reportedly even bade the Iranian president “farewell” in Persian at the end of the 15-minute call. The symbolism of an American president placing a friendly call to the leader of Iran cannot be underestimated. The gesture may be seen in the same light as Nixon’s overture to China’s Mao in the mid-1970s, or Reagan’s outreach to the Soviet Union’s Gorbachev in the late 1980s. The US-Iranian relationship has been parked for more than three decades ever since the Washington-installed puppet, Shah Mohamed Reza Pahlavi, was kicked out by the Iranian revolution of 1979. That upheaval was quickly followed by the humiliating US embassy siege in Tehran in which over 50 American personnel were held in captivity for 444 days. The “Great Satan” retaliated with decades of diplomatic sanctions that have sought to cast Iran as an international pariah, with lurid claims that it is a “sponsor of terrorism”. But Washington’s campaign of retribution against Iran went into overdrive 10 years ago when then President George W Bush labeled the country as part of an “axis of evil”. The US, joined by European allies, has steadily jacked up the sanctions regime over the past decade on the grounds that Iran is allegedly harboring plans to illicitly build a nuclear bomb. Iran has consistently denied those claims, saying that its nuclear program is for peaceful civilian purposes. It points out that its nuclear activities are within the legal framework of the Non-Proliferation Treaty and that countless investigations by the UN nuclear watchdog, the International Atomic Energy Agency, have shown no purported military application. Notwithstanding, Bush’s successor, Barack Obama, has not taken his foot off the pedal with regard to piling pressure on Iran. Into his second administration, the Obama White House and the Congress have both added new rafts of punitive measures that have seriously hampered Iran’s vital oil and banking industries. Currently, an additional bill of tougher sanctions aimed at targeting Iranian finance even more acutely is before the Senate for approval. The toll on the Iranian economy is becoming critical, according to recent reports. Furthermore, on top of all these economic and diplomatic broadsides, the US has repeatedly threatened military strikes on Iran. For a president who was first elected in 2008 largely on promises of pursuing a non-military foreign policy, Obama has since shown a surprising propensity for declaring “all options, including the military one, are on the table” in dealing with Iran. Against this grim backdrop, the new road of diplomacy between Washington and Tehran emerged as a bright vista of potential. However, any elation that might have been felt has since been tempered with setbacks that arose as quickly as the initial new direction opened up. Within hours of Rouhani touching down on Iranian soil last weekend, Obama’s National Security advisor Susan Rice was pugnaciously telling US media that the president was not agreeing to Iran’s absolute right to enrich radioactive uranium; and that such activity would have to be in the context of “full compliance of the Non-Proliferation Treaty” – which sounded like code for more of the same onerous Western-imposed restrictions that have dogged Iran for the last 10 years. More perplexing still was the barnstorming arrival of Israeli Prime Minister Benjamin Netanyahu in Washington earlier this week. Netanyahu was furious that Iran’s Rouhani had seemingly beguiled the UN with “sweet talk and smiles” and he vowed to “set the record straight”. Before Netanyahu’s tirade at the UN assembly in which he accused Iran of wanting to “wipe Israel off the map” and denigrated the Iranian leader as “a wolf in sheep’s clothing”, the Israeli premier was afforded the usual hospitality in the White House and a fireside chat with President Obama. Obama and Netanyahu capped their meeting in the Oval Office with a “display of unity” as the New York Times put it. Commentators noted a relaxed atmosphere between the two leaders, and none of the abrasion seen in past meetings. Again Netanyahu asserted: “Iran is committed to Israel’s destruction, so for Israel, the ultimate test of a future agreement with Iran is whether or not Iran dismantles its military nuclear program”. The rhetoric that Obama was in effect countenancing with his nodding head was a belligerent throwback to when Mahmoud Ahmadinejad was Iranian president. It was as if Obama’s own conciliatory speech to the UN and the weekend rapprochement with Iran had been merely an ephemeral reverie. “We take no options off the table, including military options, in terms of making sure we do not have a nuclear weapons Iran”. “Both the prime minister [Netanyahu] and I agree, since I came into office, that it is imperative that Iran does not possess a nuclear weapon. We do not want to trigger a nuclear arms race in the most volatile region in the world”. The US president didn’t register the irony in his own words that his country has long ago set the conditions for an arms race in the Middle East through its illegal proliferation of nuclear weapons on Israeli territory. Such brazenness made Obama sound like an anachronistic warrior trying to fight old wars, instead of the more enlightened persona witnessed at the UN who was seen as moving on to embrace a new diplomatic era. No wonder Iran responded with dismay to the meeting between Obama and Netanyahu and their “display of unity”. Iran’s Foreign Minister Zarif said such “flip-flops” by the American leader were destroying attempts to build confidence between the two estranged countries. While US officials have not reneged on the diplomatic path with Iran, nevertheless there has been a discernible hardening of attitude following Netanyahu’s pit stop in Washington. “We enter into these negotiations [with Iran] very clear-eyed. They will not be easy, and anything we do will require the highest standards of verification in order for us to provide the sort of sanctions relief that I think they [Iranians] are looking for”. This emphasis on the “highest standards of verification before sanctions relief” was reiterated by John Kerry during his visit to Japan this week. He also assured Israel of US commitment to its national security and that Iran will be “judged by its actions, not words”. What should be disconcerting for Tehran is Israel’s apparent role as Washington’s co-driver in the diplomatic road-trip ahead. In addition to the usual Israeli roadblocks towards Iran of demanding a complete halt to uranium enrichment and shutting down of nuclear facilities at Fordow (near Qom) and Arak, Netanyahu threw up an entirely new obstacle during his speech at the UN: the dismantling of uranium enrichment centrifuges at the Natanz plant. Also the Israeli leader blurred the red line of Iranian nuclear weapons capability. Having been proven wrong over 22 years in his prediction of Iran just being six months away from acquiring the bomb, Netanyahu has redefined the nature of the “Iranian threat”. He is now saying that Tehran “has been very careful not to cross that line but is positioning itself to race across that line in the future at a time of its choosing”. In other words, Iran represents a nuclear threat in perpetuity and in a way that it will never be able to disprove, according to the Netanyahu. 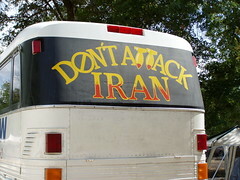 Iran’s desired destination is the end of crippling economic sanctions and the decade-long debilitating nuclear standoff. Iran’s frustration is all the more tangible because in all probability it is actually telling the truth about its peaceful technological aspirations. The Tehran government will therefore want to arrive at that destination as quickly and as smoothly as possible. But predictions of lifting sanctions within six months seem inordinately optimistic and naïve as to the insidious problem of US-Israeli confrontation towards Iran. The strategic partnership between Washington and Tel Aviv means that the implacable Israeli regime will always be there to throw a spanner in the works. And, to be honest, Washington will not be too bothered about the Israeli roadblocks since they will serve to soften up Iran even further to yield more concessions. In sum, Iran is facing a very long and rocky road ahead. This entry was posted in All Posts News Politics and-or Videos, Dandelion Salad Videos, Iran, Iran on Dandelion Salad, Israel, Nukes, Politics and tagged Barack Obama, Cunningham-Finian, Finian Cunningham, Hassan Rouhani, Iran Israel US Nukes, John Kerry, Meet the new boss the same as the old boss. Bookmark the permalink.